It is no surprise that Fight Club wasn’t a success when it was first released. It is only on repeat viewings that the real charm, intelligence and magic of Fight Club is revealed. Fight Club is one of those movies that demands repeat viewings and gets better every time you see it. It is no wonder it is a cult hit. The main reason for this is the ending. I won’t spoil it for anyone who hasn’t seen it (if such a person still exists) but once the final act begins and everything the movie has been driving towards clicks into place, you soon realise what you’ve been watching has been much cleverer than you first imagined. This is made more effective on repeat viewings because all the clues are there. You can actually work out the ending if you are watching close enough and the clues aren’t subtle either. It may be flashes of a character in your perpherary, or not so subtle hints when the main character literally reveals the “twist” within his dialogue. If you know what you’re looking for, it adds an extra, much better layer to the movie. You have to know to look for it though. That is Fight Club’s initial issue. The film is unforgiving on it’s first viewing. It starts with a flashback within a flashback and with a narration as complicated as the fast pace at which it is delivered. It wouldn’t surprise me to find that many people have trouble following the first ten minutes of the scene, as we set up the initial life of our narrator and main character. This changes once we meet Brad Pitt’s Tyler Durden though. Pitt embodies and creates a flashy, confident and iconic character. He is mesmerising with every moment he is on the screen and for the first half of the movie at least, you wish you knew someone like him. This is one of Pitt’s crazier roles and he doesn’t produce anything like this anymore. 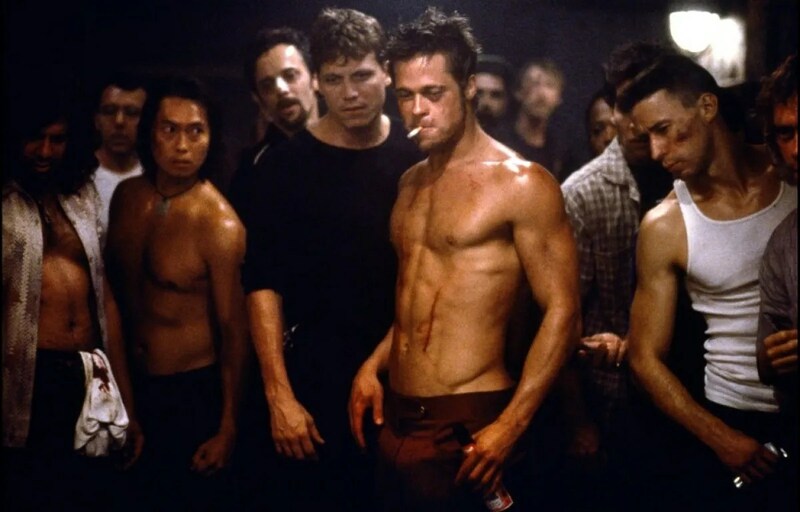 Tyler Durden has become the figure of adulation on the internet, with his quotes and actions spawning memes, and rightfully so if you take his message of anarchy at face value. With Pitt controlling the movie, it is easy to overlook the excellent performance by Edward Norton. This is his film. He is on-screen for almost the entirety of the movie and once the final act’s reveal comes into place, his role and the way he delivers it is much more impressive. A great example of his commitment is the confrontation with his boss in his office. The “fight scene” is hilarious and suitably realistic. This could be Norton’s best role yet. The film doesn’t work without the darker tone though. David Fincher’s style is obvious but this dark element gives the film it’s necessary edge. The unrelenting violence, the disgusting, brutal and abhorrent actions and then some very strange almost Hollywood blockbuster effects intercut with the mundane make this one of his most ambitious movies, considering how low it flew under the radar when it was first released. Today Fight Club tops many people’s “favourite movie” lists. It is a movie which has seeped into popular culture, at least with it’s oft-quoted “rules” scene. There is much more to love about Fight Club though; the edgy performance by career best Helena Bonham Carter or the bizarre appearance of musicians Meatloaf and “future Joker” Jared Leto. This movie has so much to offer which was bizarrely overlooked when it was first released. Overall, Fight Club rightfully deserves the plaudits and critical acclaim it has achieved since initial release. The performances are great, the story bizarre but worth the third act and the messages popular enough to still resonate today. It is a movie which only gets better with age though and you will appreciate it more with every repeat viewing. What’s so great about a movie about a guy who made a guy in his head and Tyler being a hero when he was a psychopathic figment of the narrator’s imagination?